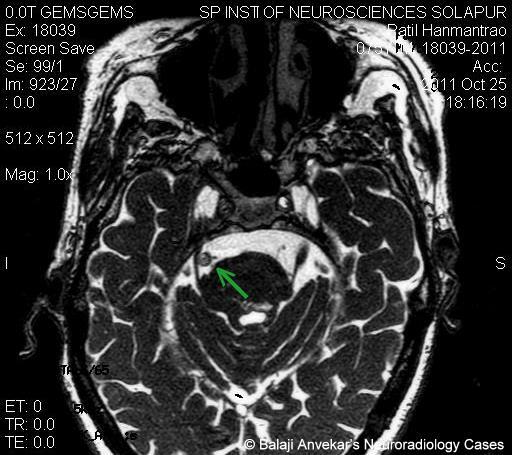 A 55 yo male with right side trigeminal neuralgia as episodic lancinating pain. MRI 3D FIESTA axial images at the level of posterior fossa show tortuous vertebro basilar causing compression over right side trigeminal nerve. Vascular loop syndrome - 5th CN compression, Trigeminal Neuralgia. Abnormal anatomical variation or course of vessel causing symptomatic compression over cranial nerves at CP Angle and IAC cistern. Spasmodic hyperfunction of nerve due to compression. Compression of 5th CN (Trigeminal nerve) present with trigemina neuralgia and 7th (Facial nerve) present with hemi facial spasm. Trigeminal nerve involvement due to vascular loop is more common than Facial nerve. 'Kindling' theory : Pulsatile vessel coming in contact with nerve induces ectopic excitations which travel retrogradly back to the nucleus of nerve. 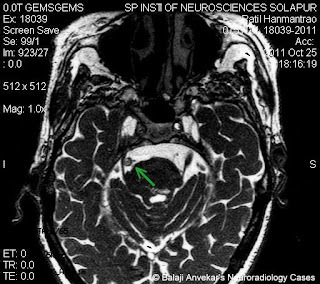 Routine T2w images used for brain may be insufficient. High index of suspicion with high resolution T2 sections in the region of posterior fossa are must. Age of presentation is older age group after 65, though it's anatomical variation or abnormality.